You can include just the items that are defined in playlists, including Genius playlists, and/or just specific artists on your iPod. Syncing by playlists, artists, and genres is a great way to sync vast amounts of music without syncing the entire library. For example, you can create four playlists that contain all essential rock, folk, blues, and jazz albums, and then select all four, or just one, two, or three of these playlists to sync with your iPod, along with everything by specific artists (such as Frank Zappa, who doesn’t fit into these categories). After connecting your iPod to your computer, click the iPod button. Then click the Music tab of the sync pages. The Music sync page appears. If you have already turned on iTunes Match for an iPod touch, the Music tab shows “iTunes Match is on” and provides only the Sync Voice Memos option for syncing voice memos from the Voice Memos app, in addition to your iTunes Match library. Click the Sync Music option at the top of the Music sync options page if it isn’t already selected. You can then click the Entire Music Library option in the Sync Music section to sync your entire music library, or choose the Selected Playlists, Artists, Albums, and Genres option in order to choose playlists, artists, genres, and albums. If you were manually managing music before clicking the Sync Music option, a message appears asking whether you are sure that you now want to sync music, stating that all content already on your iPod will be replaced. Click the Sync Music button to go ahead (or Cancel if you changed your mind), which returns you to the Music sync options page. After clicking the Selected Playlists, Artists, Albums, and Genres option, you can then select each playlist from the Playlists list, each artist from the Artists list, and (if you scroll the Music sync options page) each genre from the Genres list and each album from the Albums list. You can choose any number of playlists, artists, albums, and genres. Finally, click the Apply button in the lower-right corner of the page to apply changes (or Revert to cancel). Click Done when you are finished changing sync options. iTunes copies only what you’ve selected in the Playlists, Artists, Genres, and Albums columns of the Music sync options page. If you also select the Include Music Videos check box, iTunes includes music videos listed in the playlists (except, of course, for an iPod shuffle, which doesn’t play video). You can also automatically fill up the rest of your iPod free space with random songs (after syncing your selected playlists, artists, and genres) by selecting the Automatically Fill Free Space with Songs option. iTunes randomly chooses the music. If you select the Sync Only Checked Songs and Videos check box on the Summary sync options page, only selected items are copied. 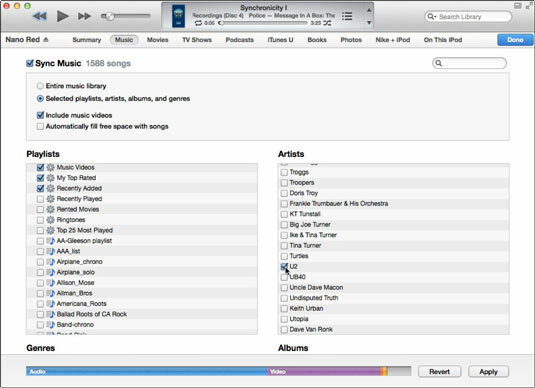 iTunes ignores items that are not selected, even if they’re listed in the chosen playlists, artists, and genres for synchronization.